The SQL STDEV Function is one of the SQL Aggregate Function, which is is used to calculate the Standard Deviation of total records (or rows) selected by the SELECT Statement. The STDEV in SQL simply returns the Standard Deviation of total number of records present in the specified column. For example, The following query will calculate the Standard Deviation of total records present in the [Yearly Income] column from Customers table. When we are grouping the data, In some cases we usually check for the conditions against the aggregated data. In these situations we use SQL HAVING Clause along with Group By Statement. 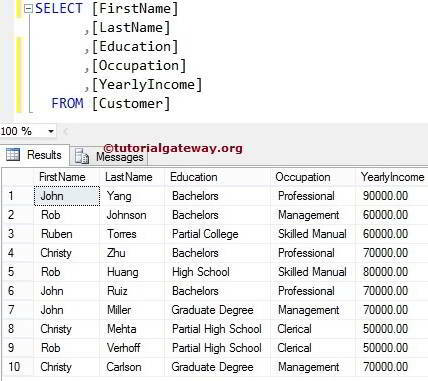 For example, The following Sql Server stdev query will group the Customers by their Occupation and then calculates the Standard Deviation of each individual group. Below lines of code will check whether the aggregated amount (Standard Deviation of Yearly income for each individual Group) is greater than 0 or not. If this is True then corresponding records will be displayed. In this example, we will show you, how to calculate standard Deviation in Sql Server using the subquery. When we are retrieving the data, In some cases we usually check for the conditions against the aggregated data. In these situations we have to use Subqueries in Where Clause. 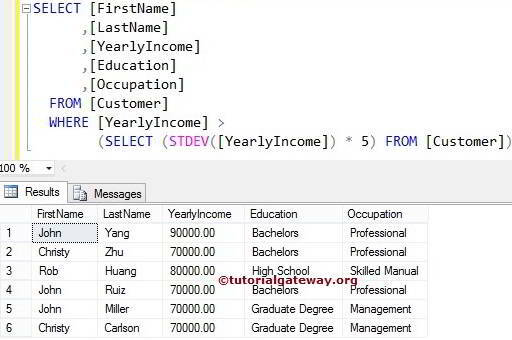 For example, The following query will return all the Customers present in the customers table whose [Yearly Income] is greater than five times yearly incomes Standard Deviation in Sql Server.